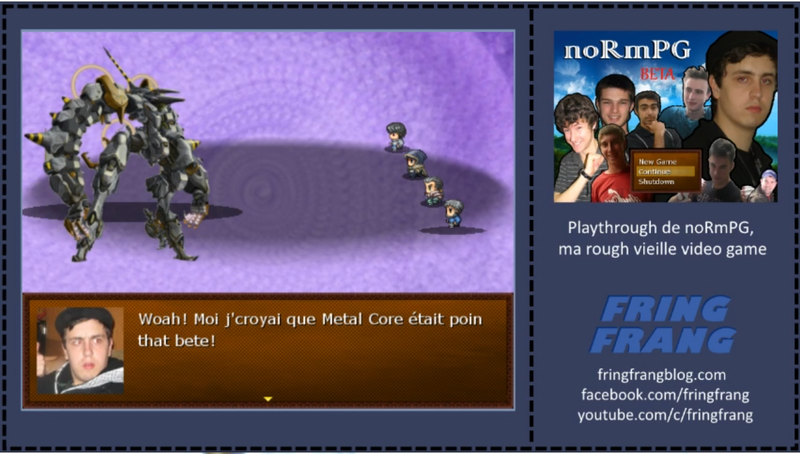 These past few months, I've streamed a playthrough of my first RPG Maker game. It was fun to revisit this absurd project with my friends, who are themselves characters in this unfinished adventure. You can watch the abridged or full playthroughs by clicking on the hyperlinks. The links can also be found in the video below, along with some information about the game. We provided commentary in our Acadian speech. Back in 2009/2010, my friend Josh Robertson introduced me and others to RPG Maker, a program used to create 2D role-playing games (RPGs). A bunch of us then started meeting up in the common room of our dormitory to create together, frequently showing each other our progress. I remember most of the games were made to be funny, featuring, for example, Power Rangers as heroes or our friends as villains. 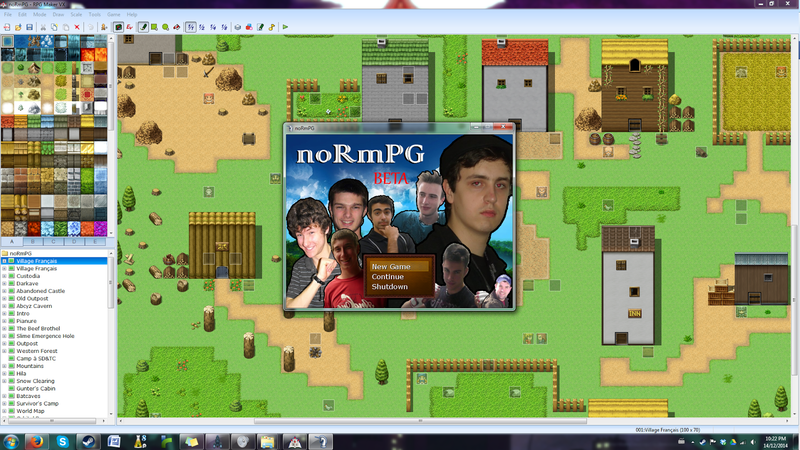 noRmPG is the awkward title I gave to my first project (since it was an RPG starring my friend Norm). Once we figured out how to bring our own resources into the engine, I began importing pictures of friends. The game's scenario was bizarre and funny since it involved my real-life friends interacting in a fantasy RPG setting. After the initial excitement of making RPGs passed, most of the group abandoned their projects. Josh and I kept at it, though. Josh was working on a game where villains from many franchises teamed up to defeat the heroes once and for all. I remember that when he had finished the first hour or so of the game, a few friends huddled around his laptop to play. To give you an idea of the tone, it involved fighting Majora’s Mask atop Zonday Tower in the pouring chocolate rain. I really wish I still had the game file to show you a few screenshots, but it's lost on my old broken laptop. As for me, I kept working on noRmPG. Since all the video games I had played until then were big productions, that's what I modeled noRmPG after. As time went on, what started as a little inside joke game became an intricate 10-hour game. Josh and I would work on our games together and help each other with testing. Our RPG Maker sessions were really fun. We continually expanded upon our RPGs as we became more skilled with the game-making engine. But the massive scope of these projects was our undoing, and both our games remain unfinished and abandoned. That’s why I chose to stream noRmPG: friends could see the game and laugh at the story without having to slog through an unbalanced and unpolished game. Although it was fun to plan and discuss the story with friends, the fact that I aimed to make a lengthy and functional RPG for my friends seems a little silly in retrospect. Now that I often play indie and hobbyist games, I know that a shorter, rougher game would have been the way to go. While building the game, I mastered RPG Maker, which helped in the development of two of my newer games, La vie d’Arcade and Pokémon Dusk. The streaming and uploading also helped me better understand Twitch and YouTube, two platforms I didn’t know how to use very well. noRmPG is a reflection of its time. Everything from the dated character portraits, old jokes and situations from years ago bring me back to my early university years. There were unfortunately a few embarrassing moments that I chose not to stream or upload. I found that some disrespectful jokes weren’t funny to me anymore. But overall, the stream was really fun! Laughter brought us to tears more than once. Thanks to Normand Pothier, Alexandre Tremblay, Ernie Deveau, Ricky John Godin, Jon Roy, and everyone who participated in the stream on the air and in the chat. It was a blast! And thanks to Josh Robertson for showing me RPG Maker and kickstarting my game development hobby. thank for share good stuff.